Ah, the million-dollar question... How is tequila made? You might be a tequila drinker, but chances are you are not a true tequila aficionado. The difference? Anyone can drink tequila, but not everyone knows what it takes to make it. So how is tequila made? If you’ve taken the time to research how tequila is made, I say you’re awesome. If that’s not your case, however, you’re still awesome... you just have some quick learning to do! 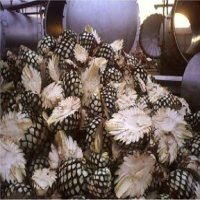 Read on for a complete overview of how tequila is made. If you're just looking for a general overview, though, try this "How To Make Tequila" flowchart instead. Tequila is an alcoholic drink produced with blue Weber agave. This agave plant is also known as weberi agave, weber agave, and agave tequilana (its scientific name). 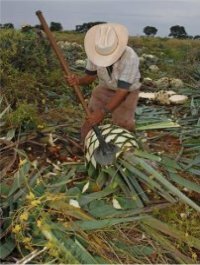 Agaves from the Highlands produce sweet and frutal tequilas, while agaves from the Lowlands are more herbaceous in nature. This becomes evident in the liquor's aroma and taste. It has a denomination of origin which limits production to 5 Mexican states: Jalisco, Nayarit, Tamaulipas, Michoacán and Guanajuato. The Consejo Regulador del Tequila (CRT for short) is the entity responsible for enforcing laws and regulating all tequila products. A similar Mexican drink, mezcal, also uses agave. 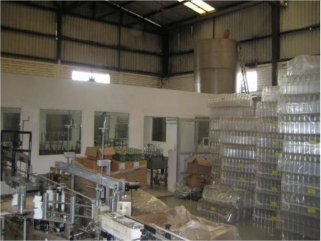 Mezcal can be produced anywhere in Mexico and is subject to different regulations than tequila. An aficionado will also recognize that mezcal has a different, usually harsher flavor. In short, all tequila is mezcal, but not all mezcal is tequila. Now on to our question: how is tequila made? The process begins with the jima, the harvest, and the jimadores, those responsible for growing and eventually harvesting the agave. Producers may have their own agave, but most choose to buy it from growers. The plant is left to grow 8 to 10 years, enough time for agave to produce honey within its piña (I’ll call it “pina” for all you gringos... You’re welcome!). Jimadores will then use a coa, a tool used for centuries, to extract the pina and clear it of leaves and thorns. But how is tequila made from this agave? The pinas will be weighed, cut up in halves or quarters, and cooked. The traditional method takes pinas and places them in hornos, or cooking ovens. The modern method involves using steel pressure cookers called autoclaves. The latter approach cooks the pinas faster. Fortunately, flavor doesn't vary with either process. Agave is cooked to transform starches into sugars, which will then become transform into alcohol. To extract the agua miel, or honey water, the cooked fruit passes through grinding blades. Fibers are sprayed with water, ensuring all sugars are released. Leftover fibers, known as bagazo, are generally used as fertilizer for agave fields. The juices are now ready to be fermented. This is each tequila starts to acquire its unique taste and classification. If the producer wants 100% agave tequila, then the juice passes straight to fermentation vessels. 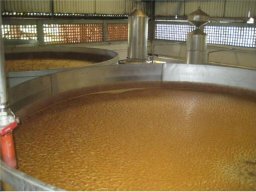 However, if he wants mixto tequila (non-100% agave tequila), then the agua miel must be placed in formulation tanks. Sugarcane or molasses sugar are then added to the juice. Only then can the mixto be placed in fermentation vessels. Now’s the time alcohol begins to appear (finally!). Producers will introduce yeasts. These can either be chemical catalysts or natural ingredients. The tanks are lightly heated and carbon dioxide is released, giving the agave juice 5% alcohol content per volume. Is this how tequila is made...? Not yet, but we're getting close. The mosto, or fermented agave juice, is finally ready for distillation. The juice will be heated to alcohol’s vaporization point and then cooled and condensed to create ordinario (ordinary in English). You could try to drink this ordinario, but chances are you’d be blinded and intoxicated afterwards! That is why Mexican law requires all tequila to be distilled twice. The mosto can be distilled three or even four times for top-shelf tequila. The first distillation will remove all “heads” and “tails”, the first and last portions of the distilled product. These contain bad alcohols and other impurities, which is why they must be discarded in favor of a quality (and safe) drink. A second distillation determines the percent of alcohol the tequila will have. Premium tequila will aim for 40% alcohol per volume or 80 proof; a bulk, mixto, or lower quality spirit instead aims for 55% alcohol per volume or 110 proof, which will be later diluted with purified water. Following along? Good... We finally have tequila! Tequila blanco, to be precise. A blanco is agave in its purest alcohol form (it’s also known as plata and silver tequila). Finally, something we can drink! But this blanco can still be worked with. Reposado and añejo tequila can be obtained from a blanco (again, let’s make it easy on your eyes and call it “anejo”). To do so, silver tequila is aged in barrels. 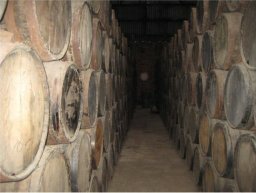 Reposados use redwood or oak barrels, while anejos almost exclusively use Kentucky bourbon barrels (I’ve also heard of former cognac barrels being used for anejo). A reposado will age from 2 to 12 months; an anejo from 1 to 3 years; and a new, recently regulated extra anejo will age for over 3 years. 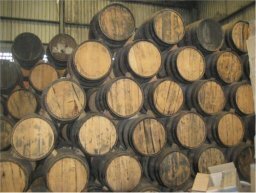 The more time the liquor spends within a barrel, the more color and tannins the final product will have. 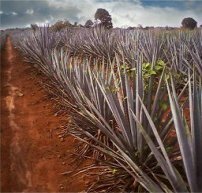 How is tequila made? 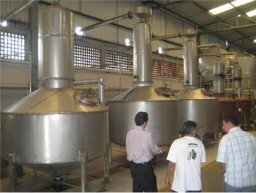 It's made by harvesting, cooking, fermenting, distilling, and aging the blue agave. This final product (blanco, reposado or añejo) is ready to be drinked. Now you can show off your new tequila knowledge at your next reunion. Happy drinking!